Sh2-279 is a bright nebulae that includes a reflection nebula located in the constellation Orion. It is the northernmost part of the asterism known as Orion's Sword, lying 0.6° north of the Orion Nebula. The reflection nebula embedded in Sh2-279 is popularly known as the Running Man Nebula. Sh2-279 comprises three NGC nebulae, NGC 1973, NGC 1975, and NGC 1977 that are divided by darker nebulous regions. It also includes the open cluster NGC 1981. 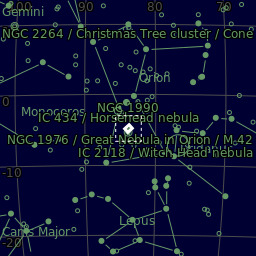 The brightest nebulosity, later listed as NGC 1977, was discovered by William Herschel in 1786. The two smaller reflection nebulae were first noted by French astronomer Heinrich Louis d'Arrest, NGC 1973 in 1862 and NGC 1975 in 1864.